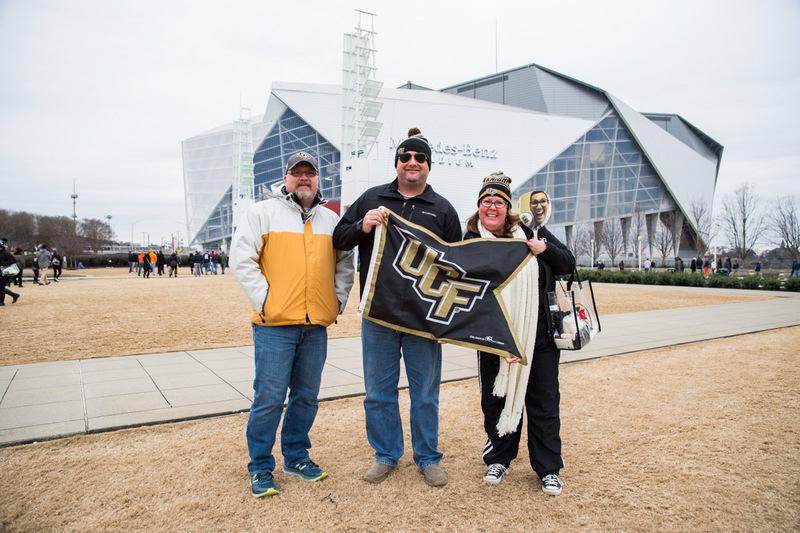 1Knights fans start to gather at Mercedes-Benz Stadium in Atlanta, site of the 2018 Chick-fil-A Peach Bowl. 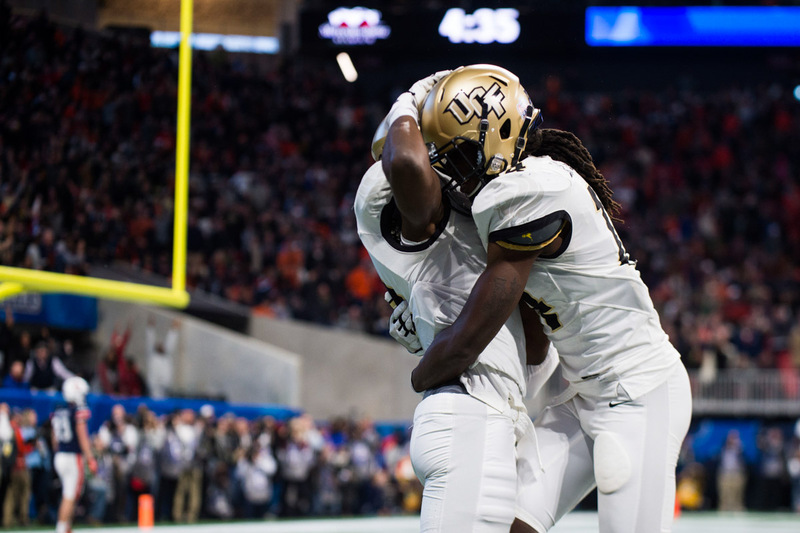 3Knights Matthew Wright and Adrian Killins Jr. encourage each other before game time. 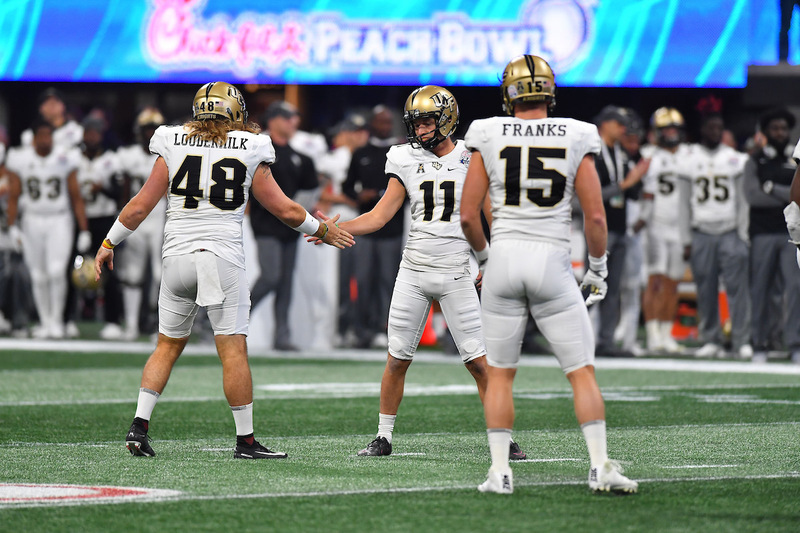 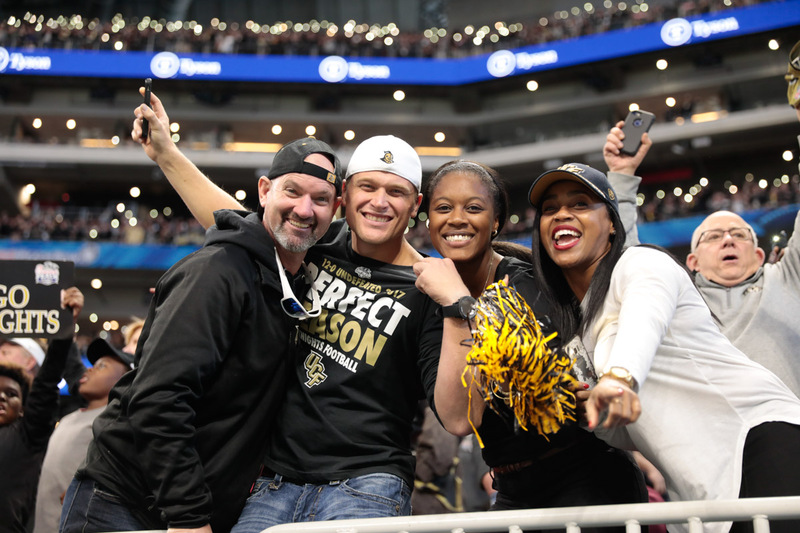 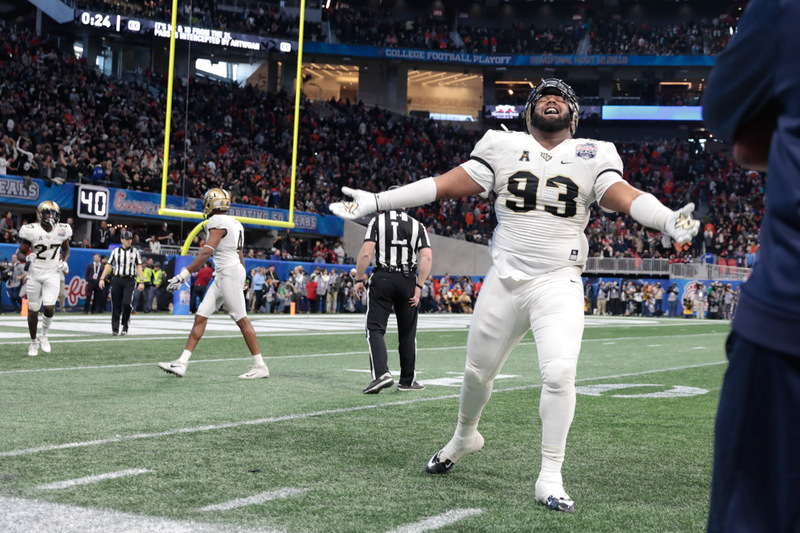 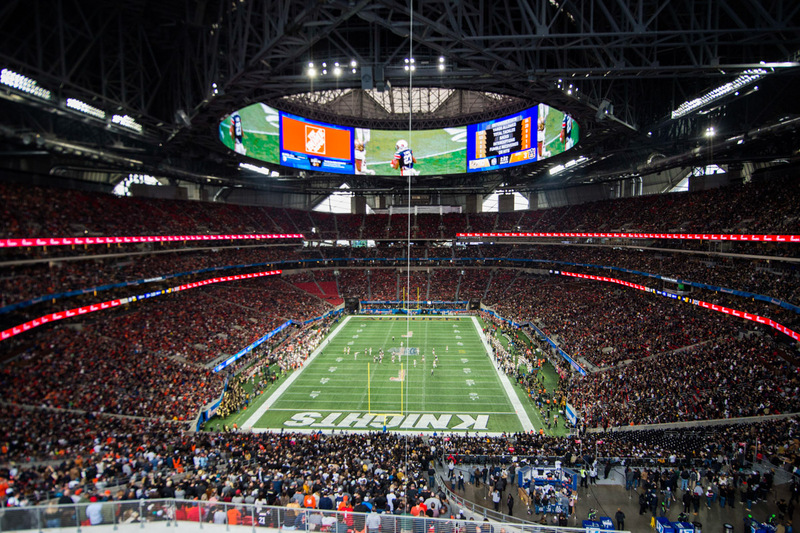 4Black and Gold were the colors of the day for the Peach Bowl. 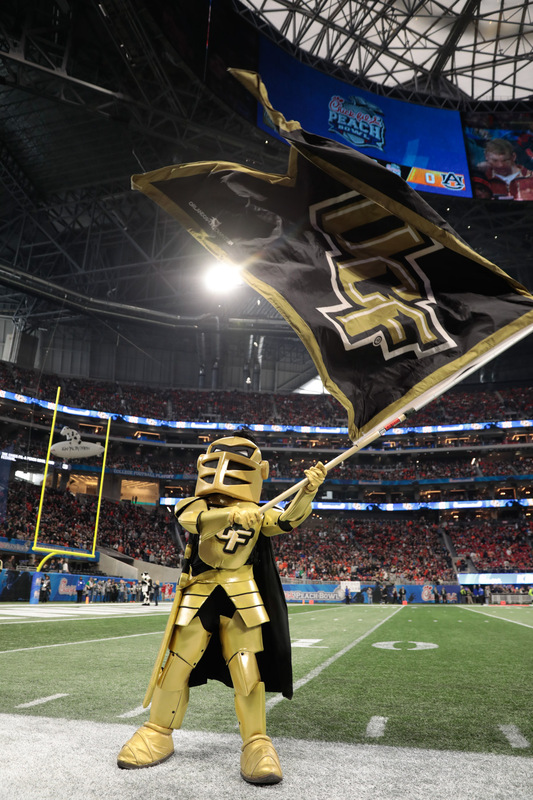 5Knightro waves to the Peach Bowl crowd. 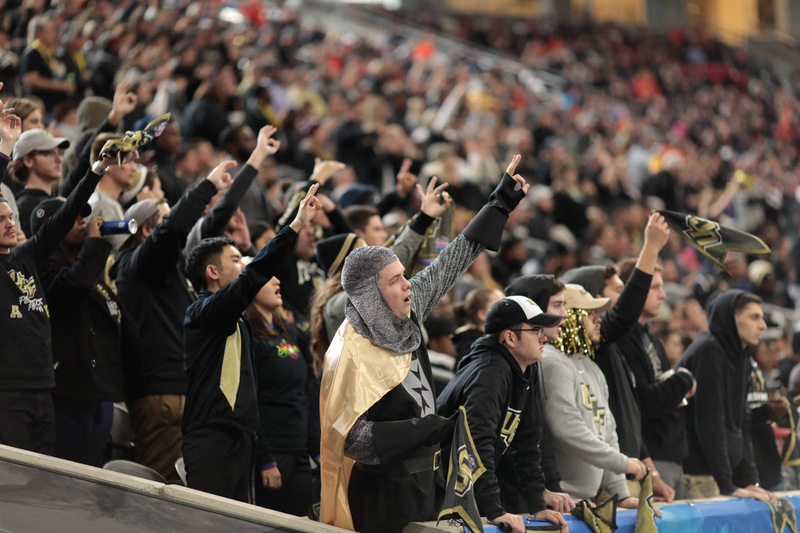 671,109 fans turned out to support the Knights and the Tigers. 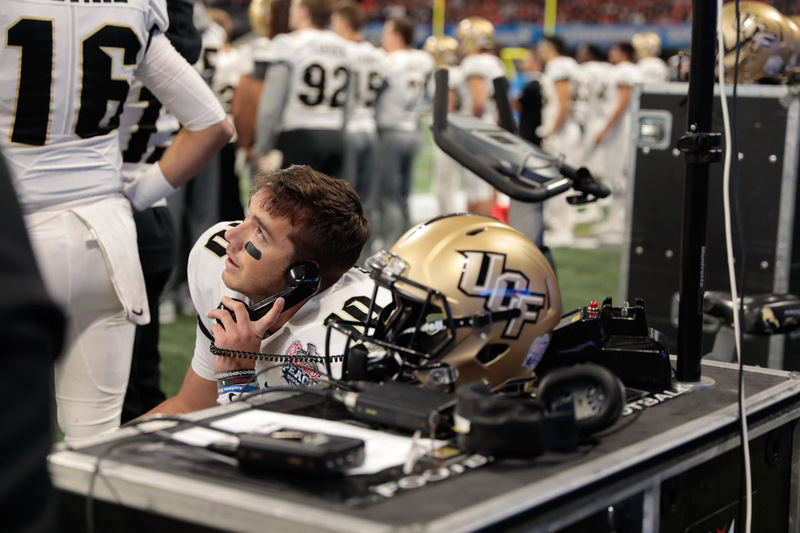 8Quarterback McKenzie Milton talks over strategy. 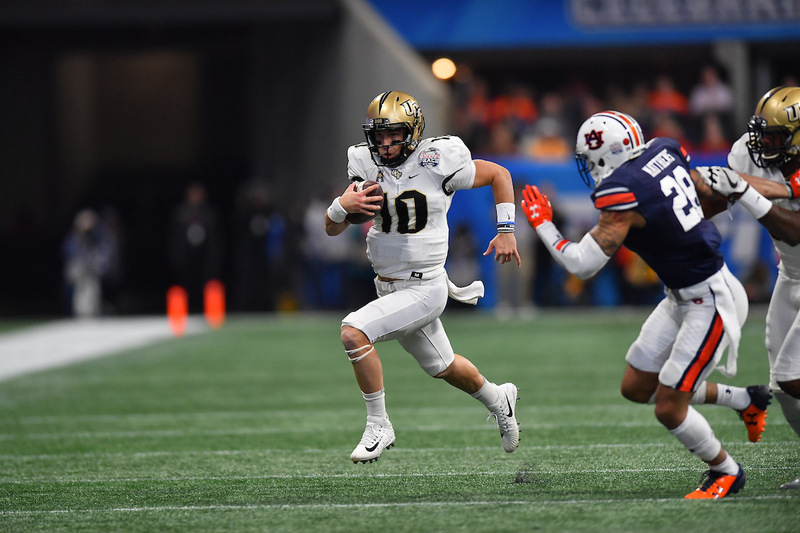 9McKenzie Milton scrambles for a big gain. 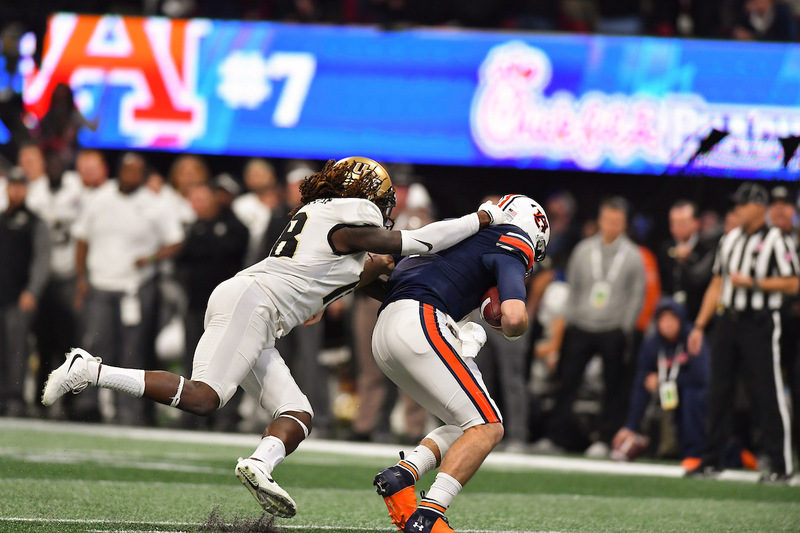 13Linebacker Shaquem Griffin sacks Auburn quarterback Jarrett Stidham. 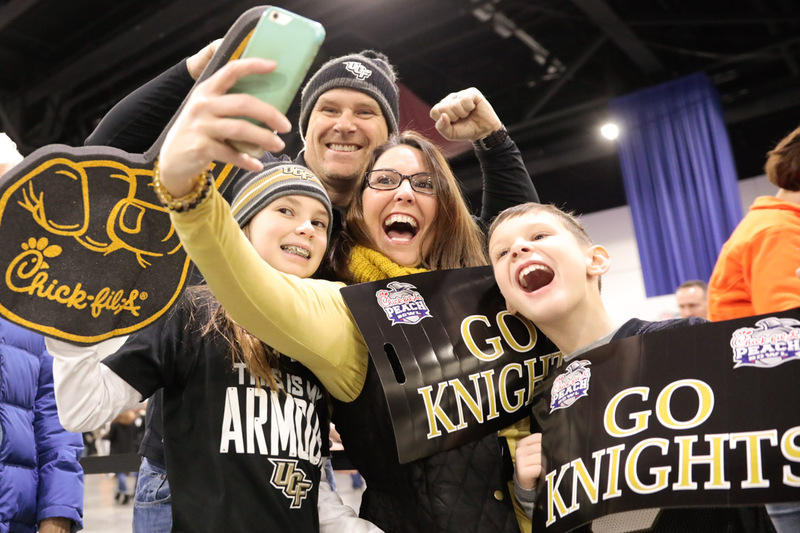 14The perfect Knights season can add one more victory to this pre-game sign. 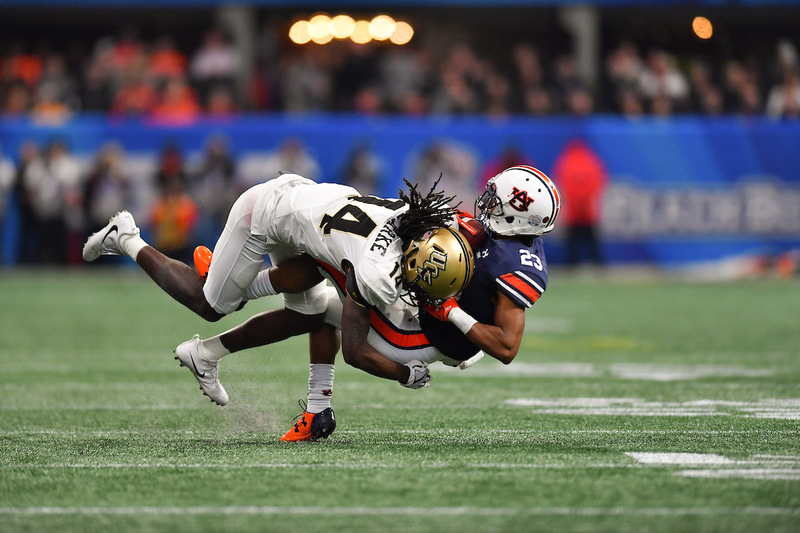 16Nevelle Clarke makes a stop. 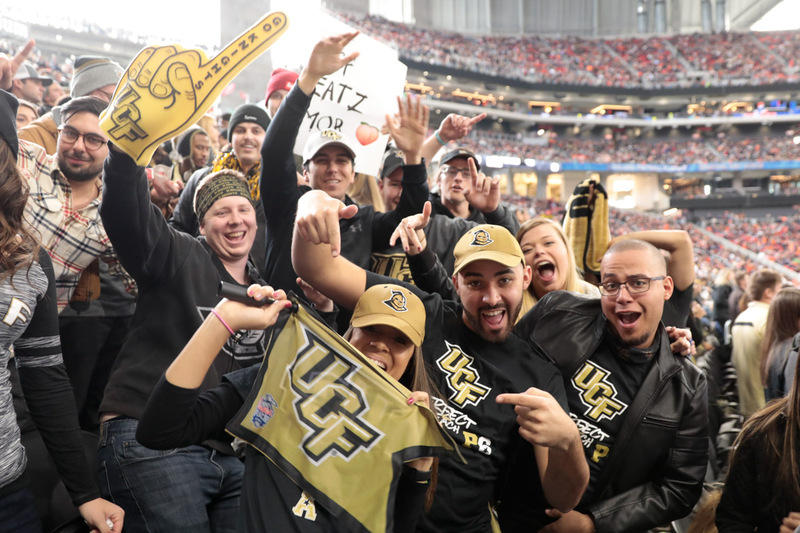 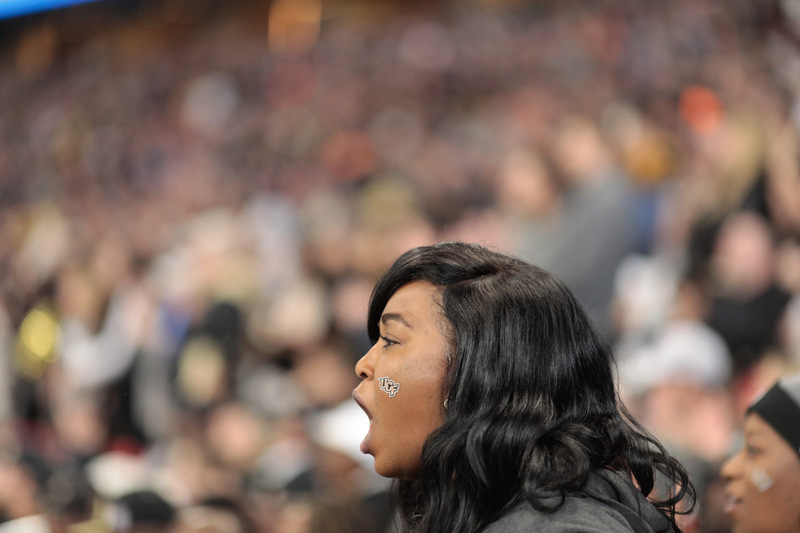 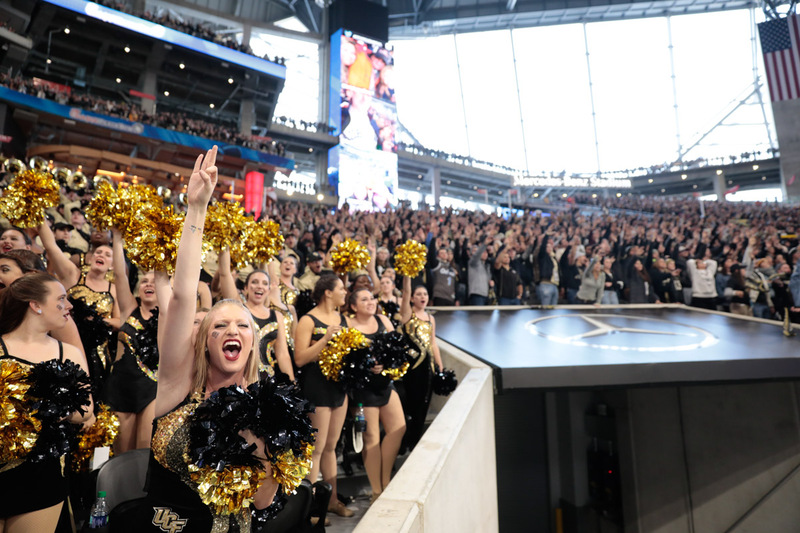 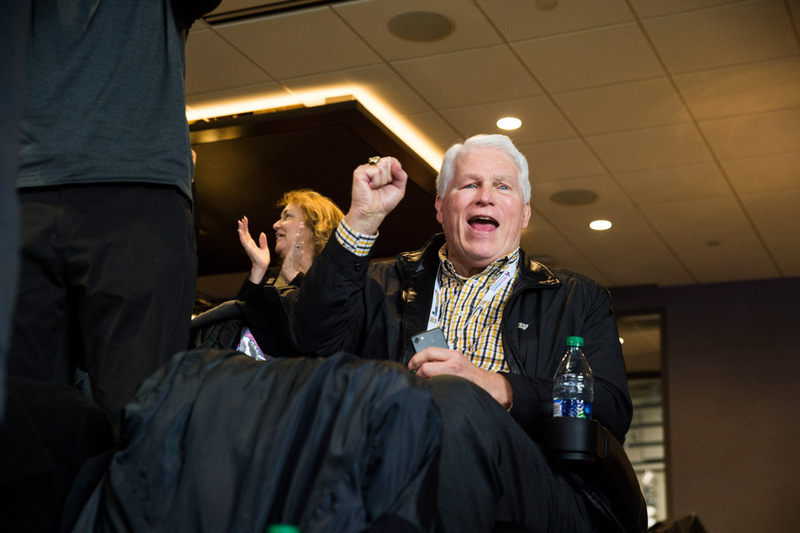 17UCF President John C. Hitt cheers on the Knights. 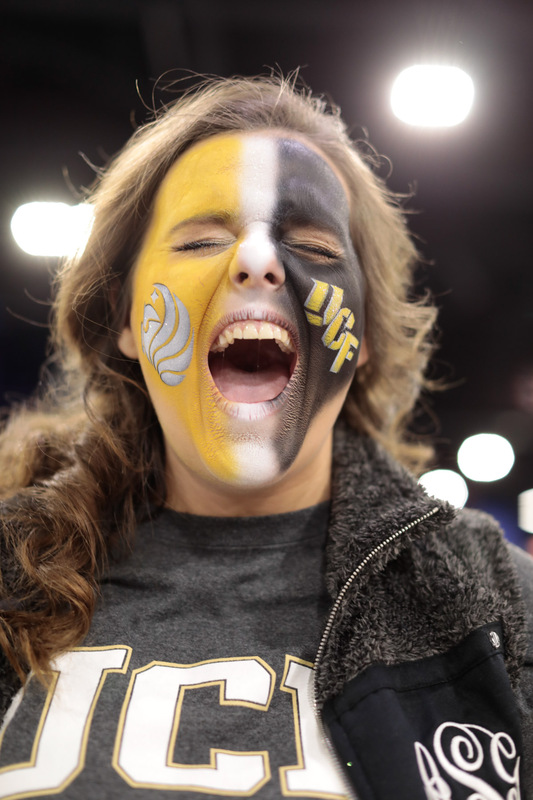 18Spirited — and dressed out — fans yell their support. 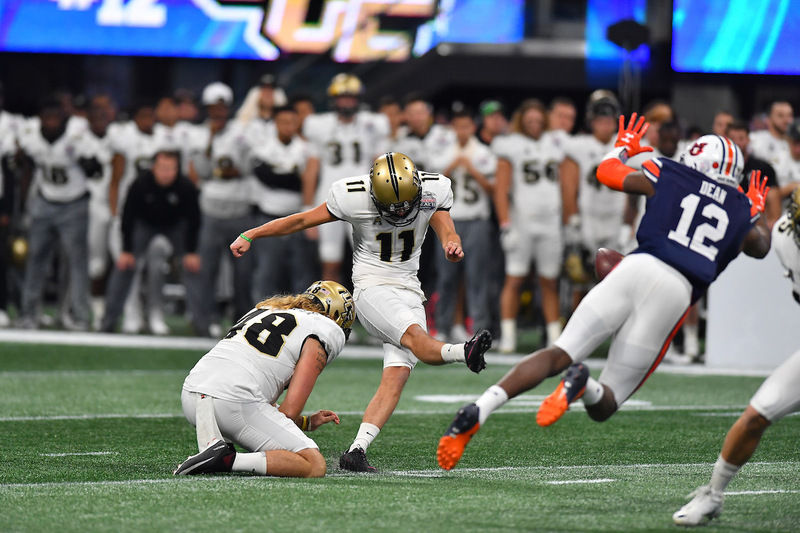 21Kicker Matthew Wright puts one through the uprights. 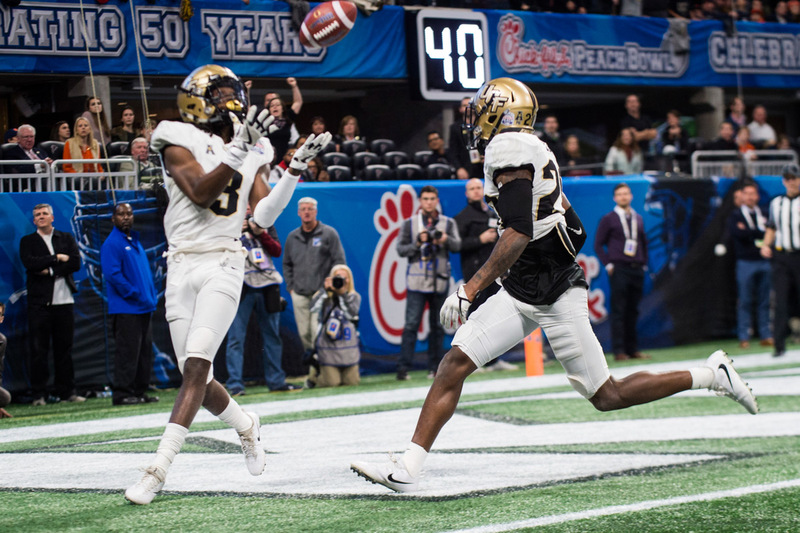 22Wide receiver Tre-quan Smith hauls in a pass. 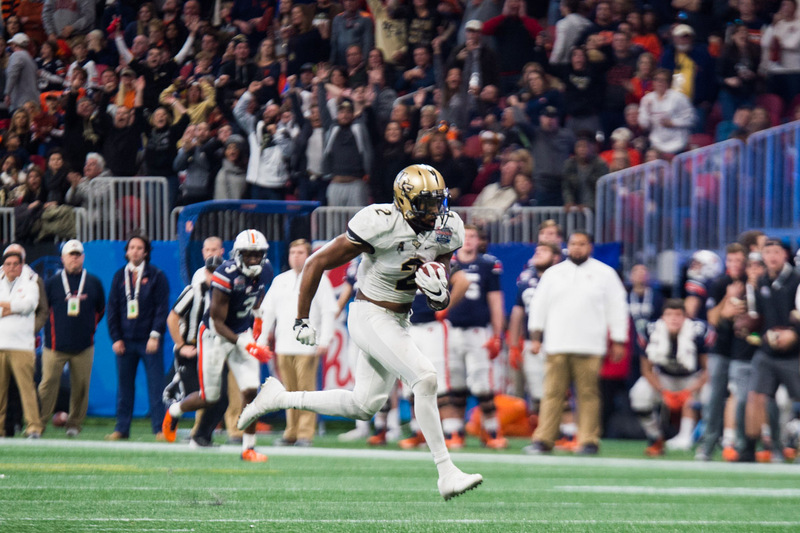 24Linebacker Chequan Burkett runs back an interception for a touchdown in the final six minutes of the game. 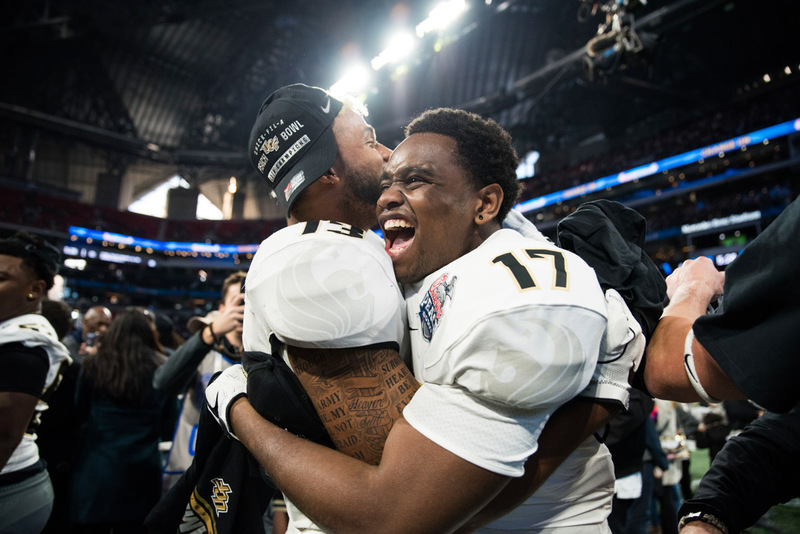 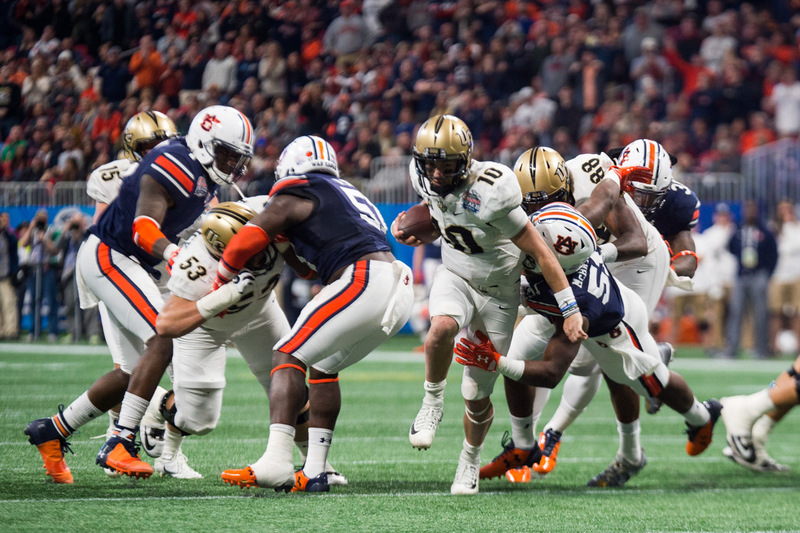 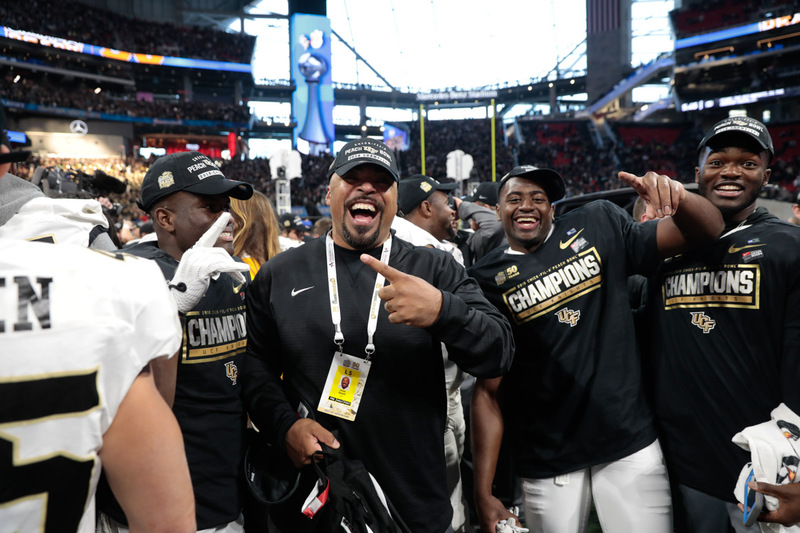 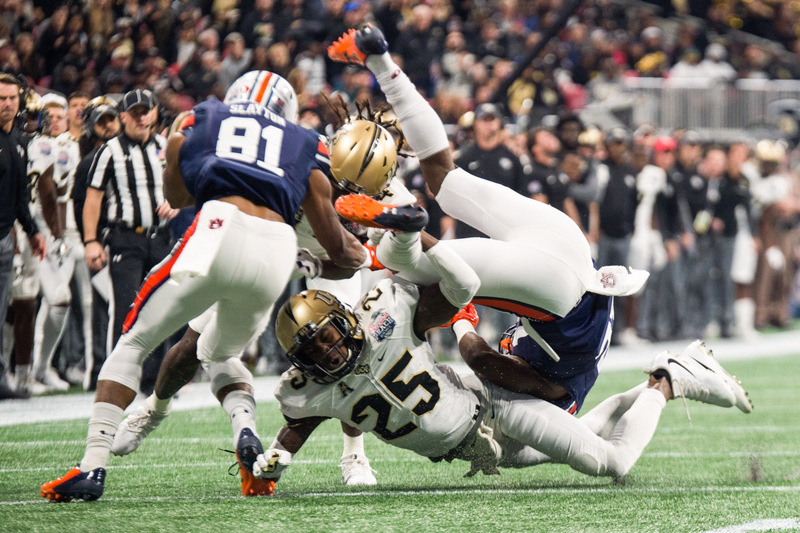 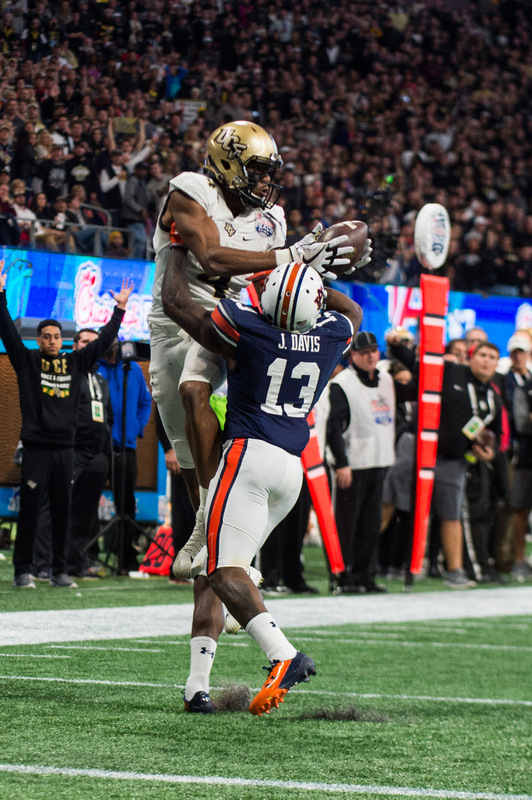 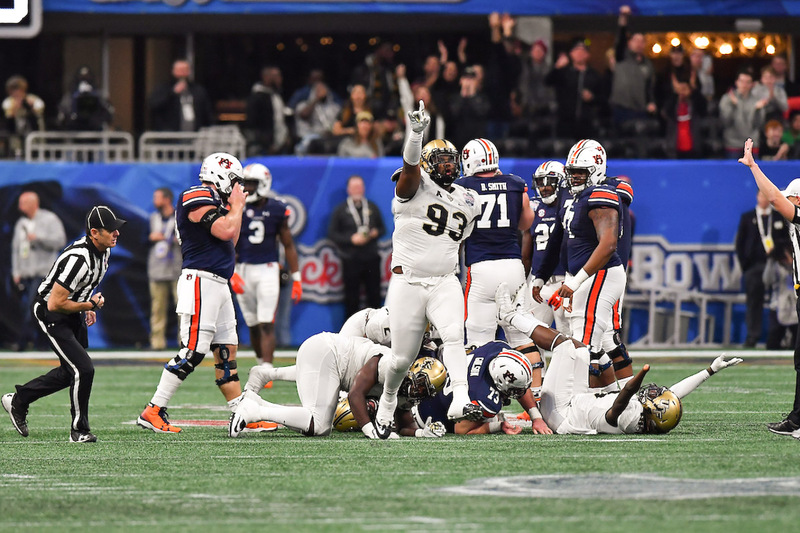 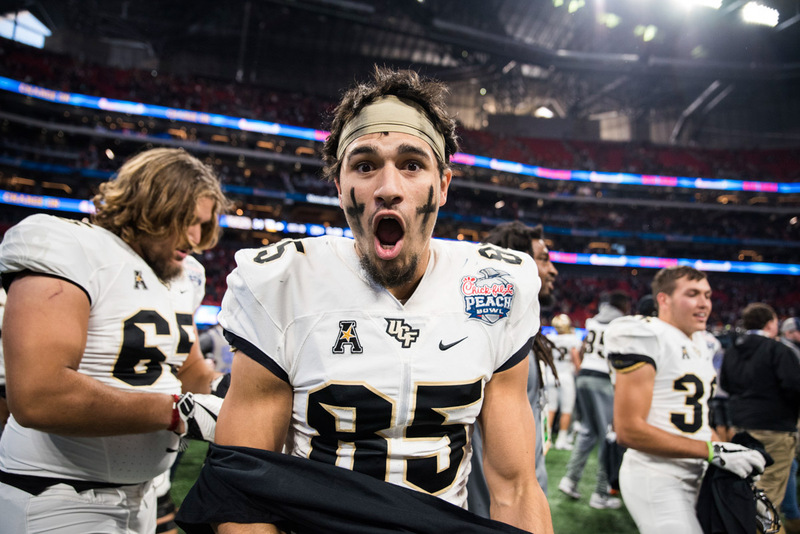 28With 24 seconds left in the game and Auburn poised to score a touchdown, defensive back Antwan Collier intercepted a pass in the end zone, clinching the win for UCF. 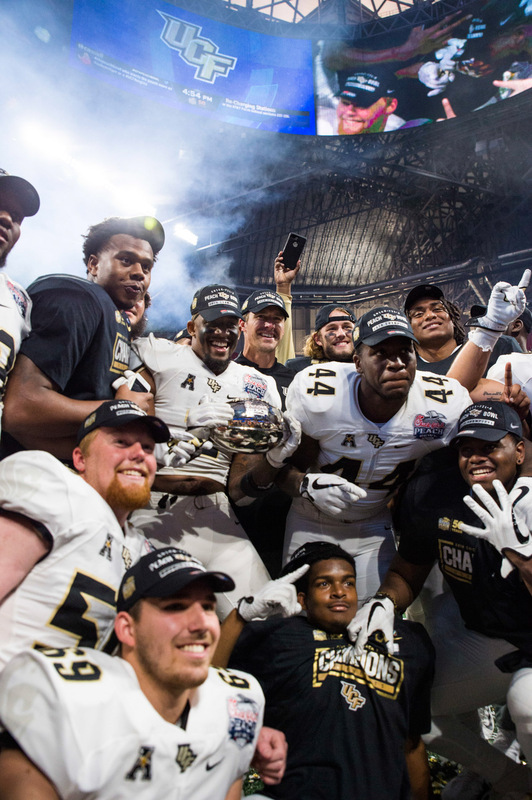 31Knights celebrate the moment of victory. 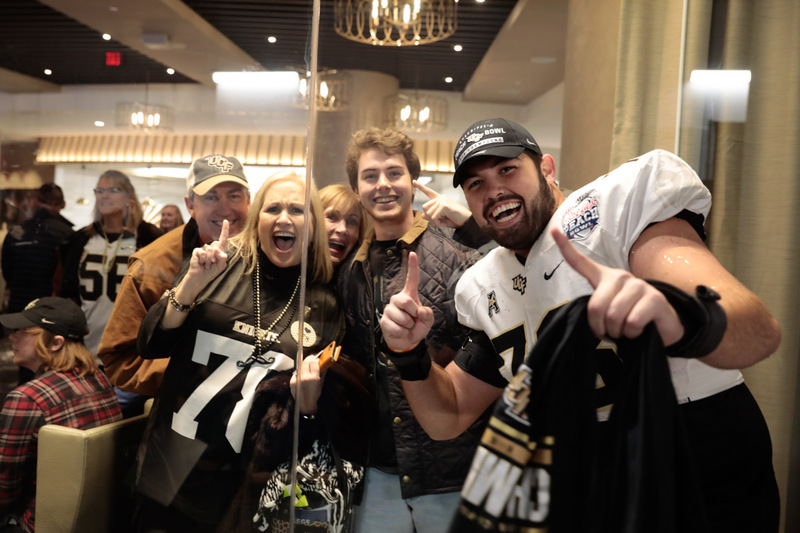 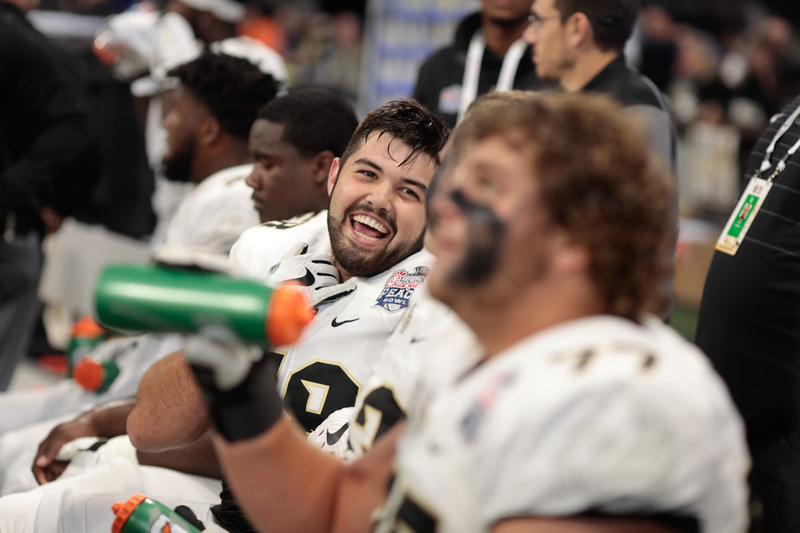 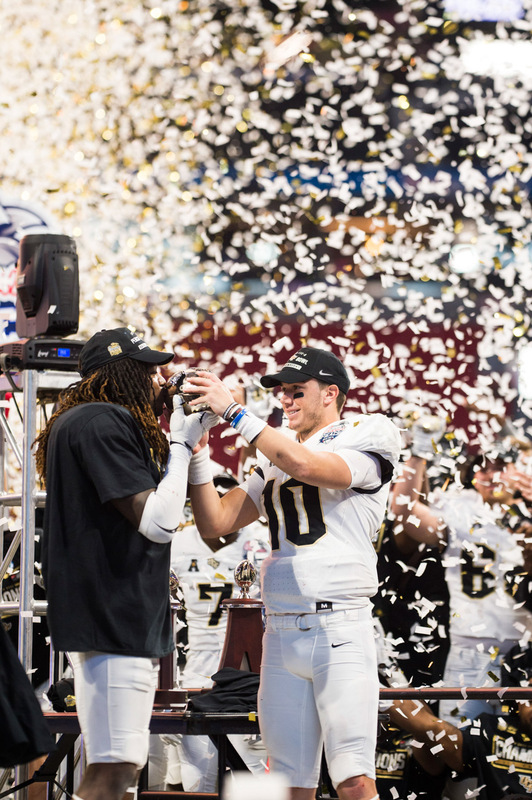 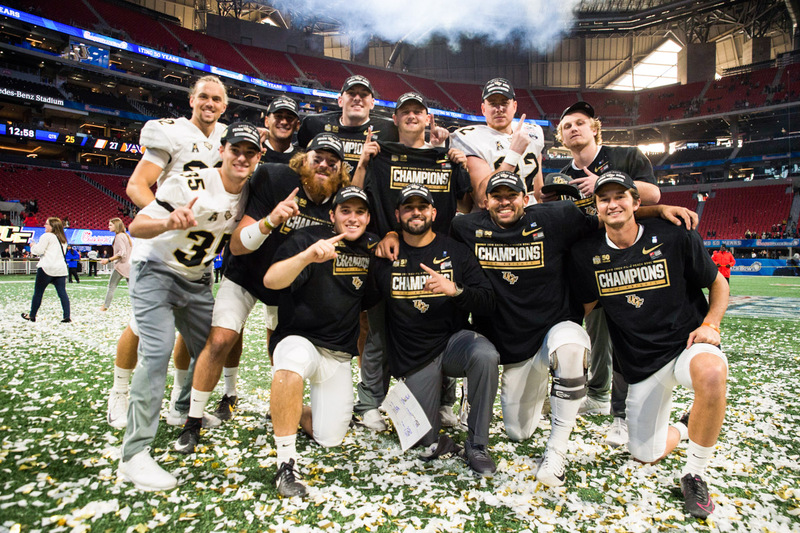 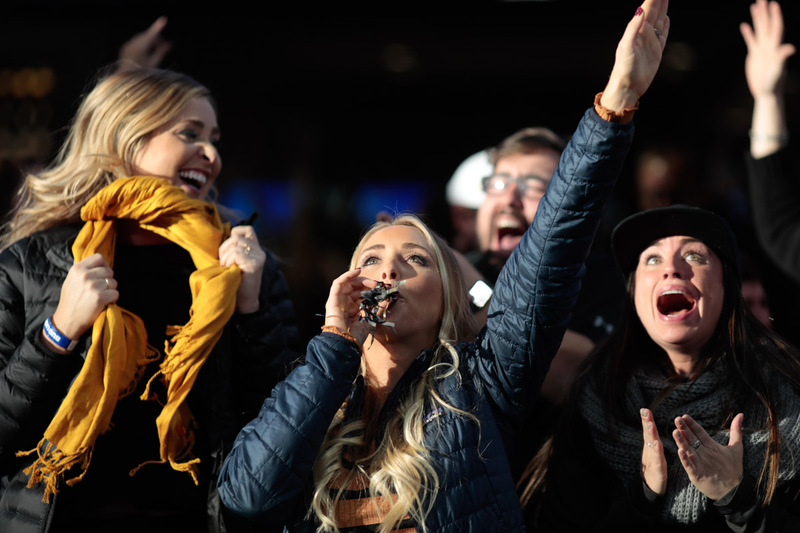 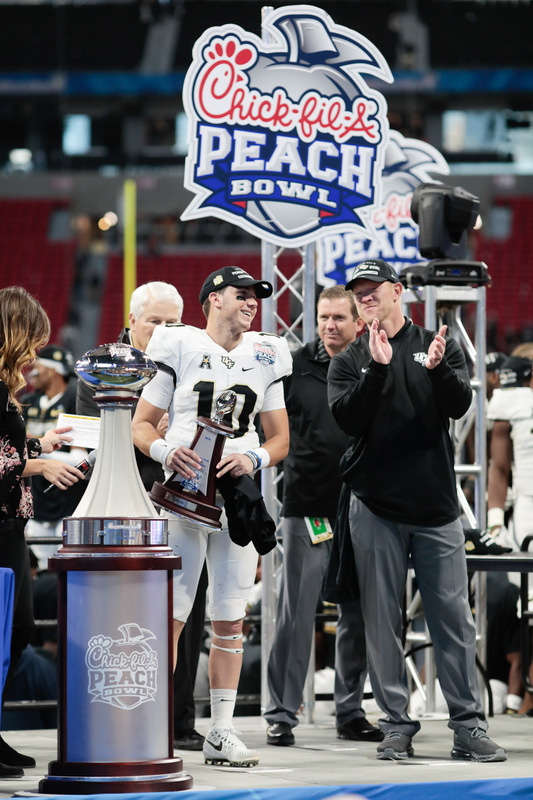 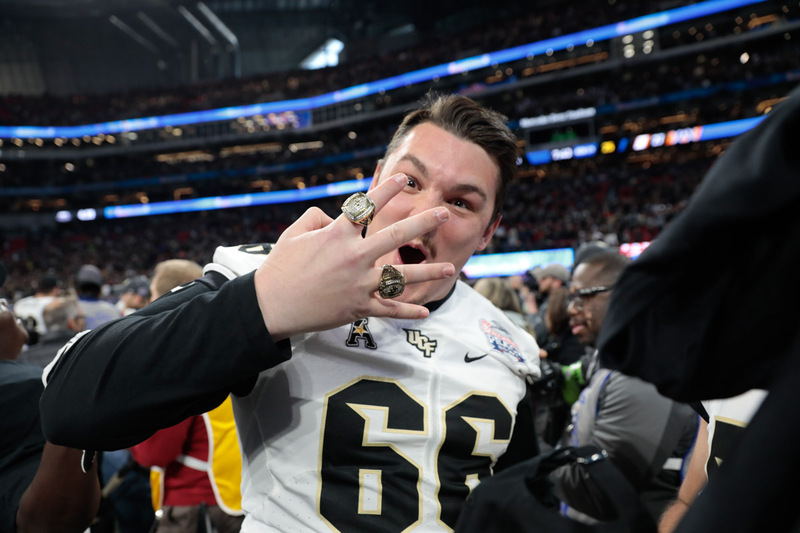 36Quarterback McKenzie Milton received the Chick-fil-A Peach Bowl Offensive MVP Award. 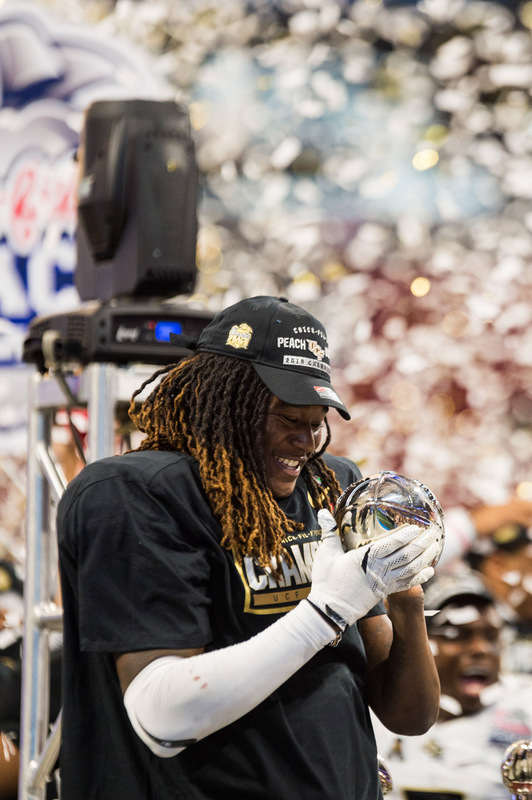 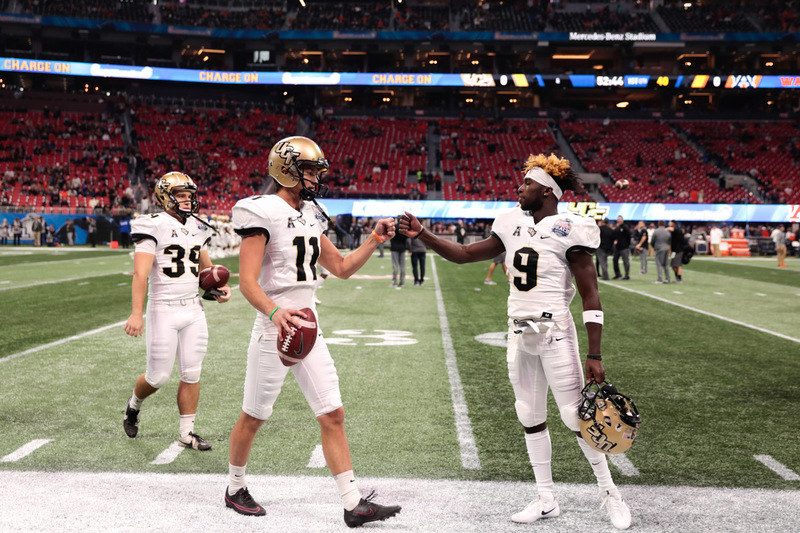 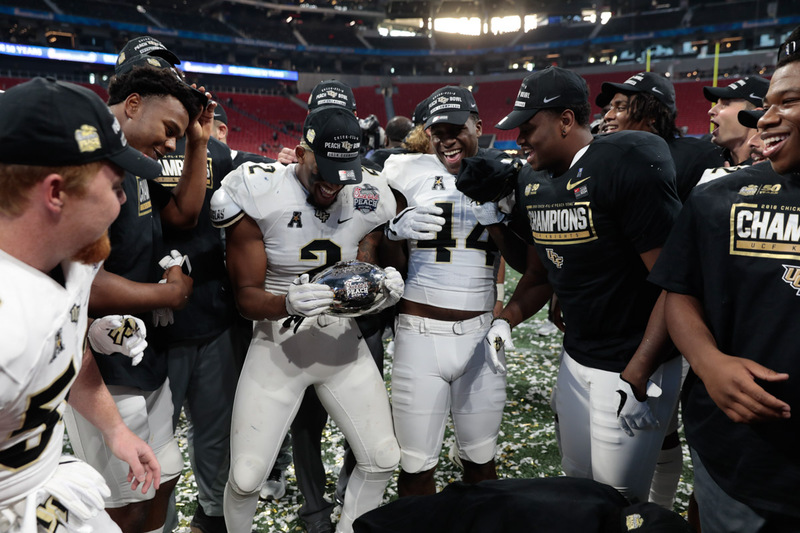 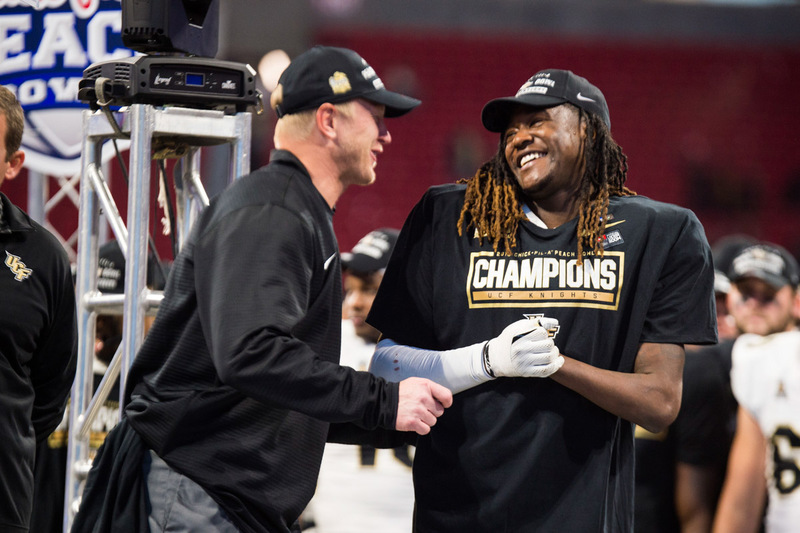 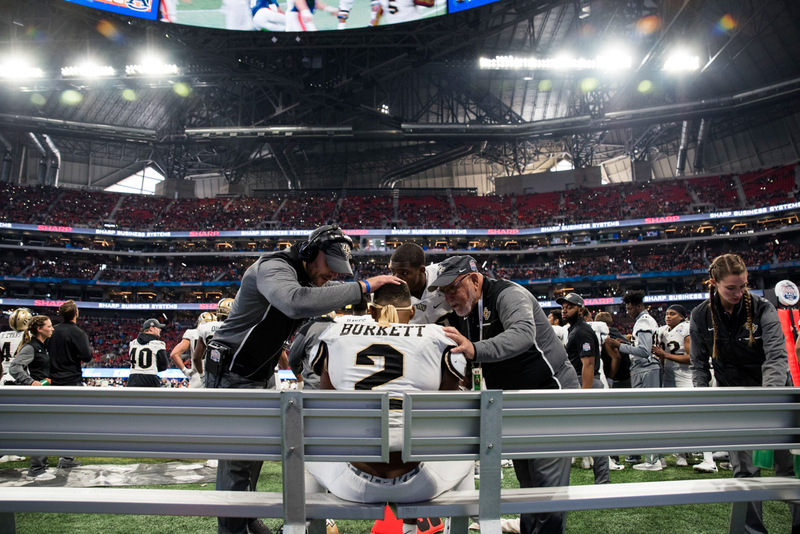 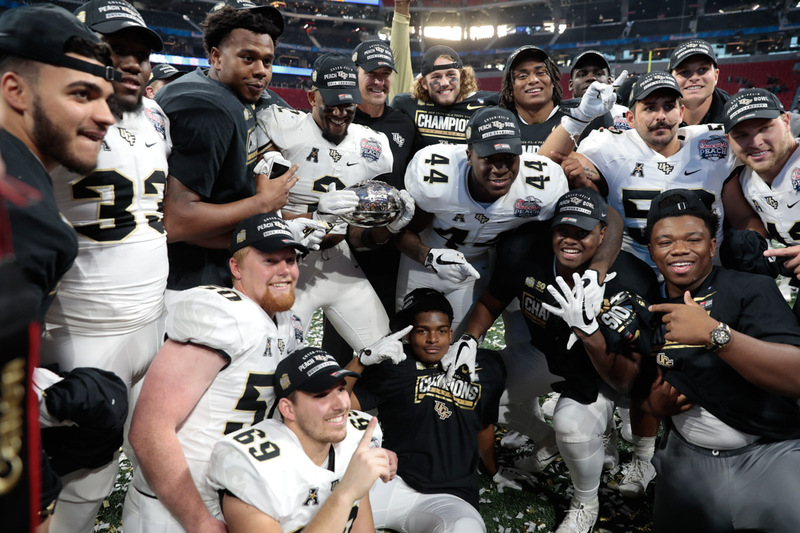 37For his final game with the Knights, linebacker Shaquem Griffin received the Chick-fil-A Peach Bowl Defensive MVP Award. 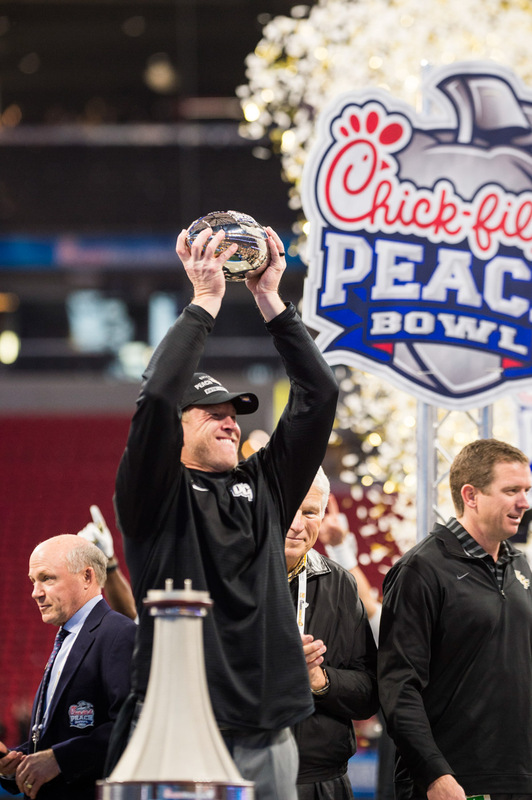 38Coach Scott Frost holds up the Peach Bowl trophy. 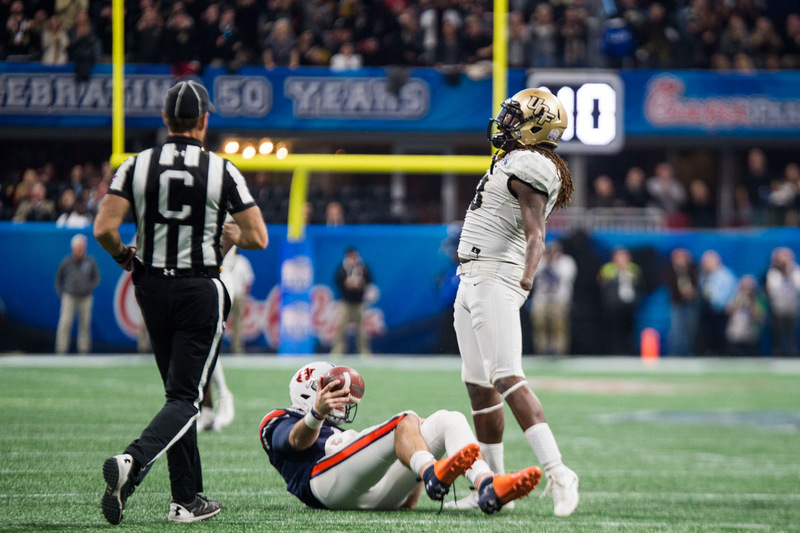 42Tristan Reaves celebrates the win. 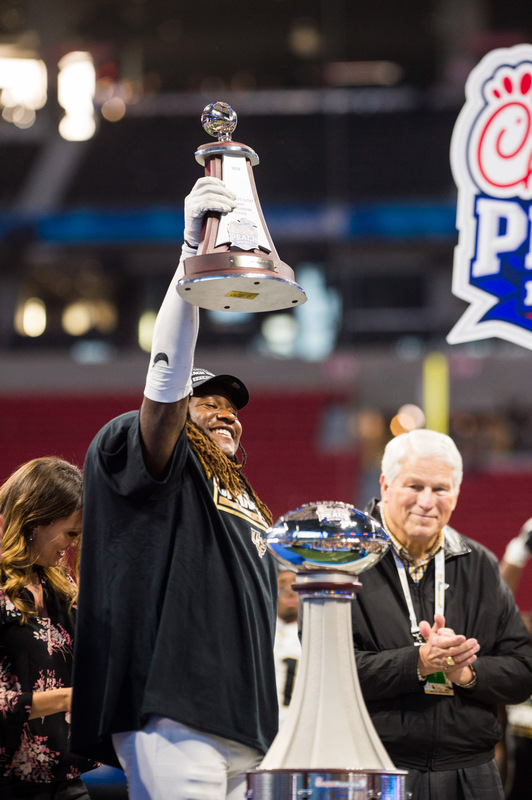 47Linebacker Aaron Evans revels in the championship victory. 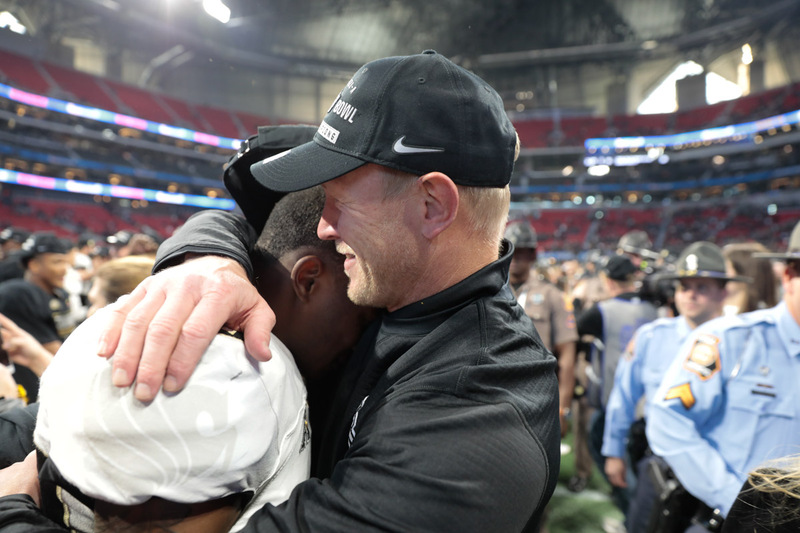 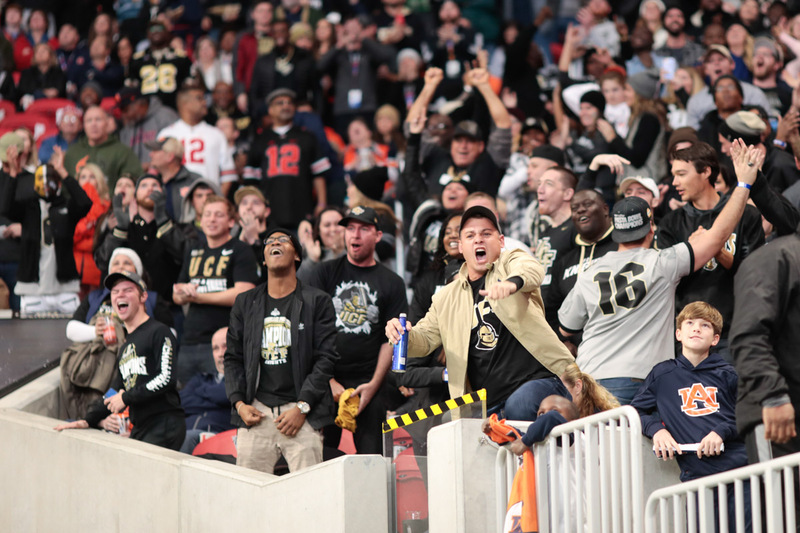 50Coach Frost acknowledges the support of the jubilant fans.